Oprah Winfrey with Stacey Abrams. Photo courtesy: Feroza Syed. 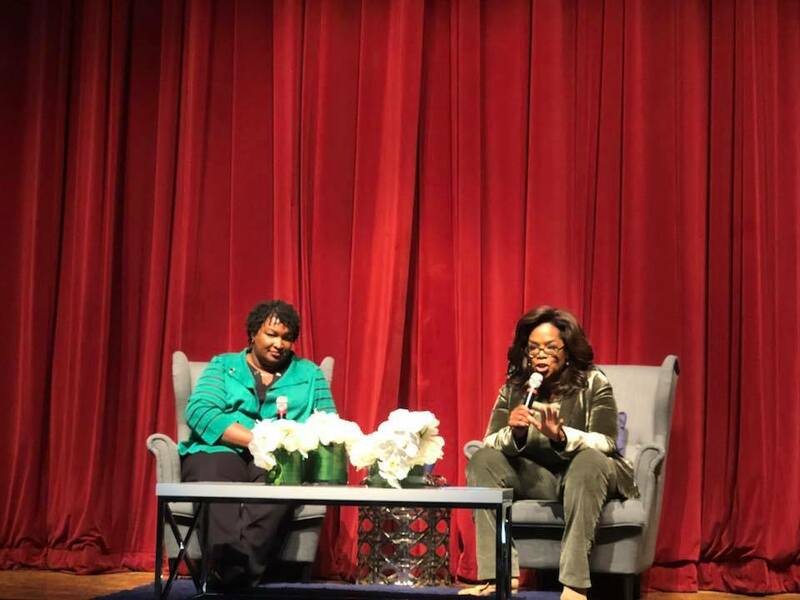 Los Angeles, Nov 2 (IANS) Talk show host-producer-philanthropist Oprah Winfrey returned to the campaign trail for Stacey Abrams, a Democrat who is running for Governor of Georgia in the upcoming midterm polls, saying “all the noise”, “crazy talk” and “vitriol” was now part of political discourse. “You know what? They are designed to confuse and confound you with fear. They are not designed for people with discernment,” she told a crowd on Thursday at the Cobb Civic Centre in Georgia, reports variety.com. Winfrey did not mention US President Donald Trump’s name or reference Abrams’ Republican opponent, Brian Kemp. But she called for woman to do the right thing. “Women, people. We have discernment… When you can feel what is the right thing to do, you can’t be influenced by propaganda and fear,” she said. This was Winfrey’s first foray into midterm politics this year, after largely sitting out the 2016 presidential campaign. At the event on Thursday, Winfrey again dismissed those prospects. She touched on one of the major issues of the Abrams-Kemp campaign: voting rights. “I’m here today because of the men and because of the women who were lynched, who were humiliated, who were discriminated against, who were suppressed, who were repressed and oppressed. I refuse to let their sacrifices be in vain,” Winfrey said. Kemp, Georgia’s Secretary of State, has been challenged for his decision to freeze some 50,000 voter applications. Abrams’ campaign has called on him to resign, while he has said that it is a manufactured problem at a time when registration is at a record high. She told the crowd that she was registered as an independent. Winfrey’s first dive into the political arena came in 2007, when she endorsed Barack Obama and campaigned for him in South Carolina and other states. The midterm election are slated to take place on November 6.